Recently I’ve gotten several comments about how delicious my “comfort food” menu sounded (or something like that). I know the comments weren’t intended to make me re-think my meal planning, but they did! It made me realize that I was planning too many carbs into my weekly menus. I default to carbs because they are delicious (amIright?) and they are inexpensive. I decided to be intentional about how many or how few carbs we eat each day. I’m certainly not cutting them out or even eating “low carb,” but I am watching what I put on the table. Here’s how I did that – for the lunches I take to work, I choose carrots and hummus instead of chips or granola bars. I packed extra fresh fruit instead of crackers for my afternoon snack. For our suppers, I thought through what I would normally serve, took away a potato or bread and added a fruit or vegetable. I know fruit has carbs – we aren’t cutting them out, just choosing different ones. 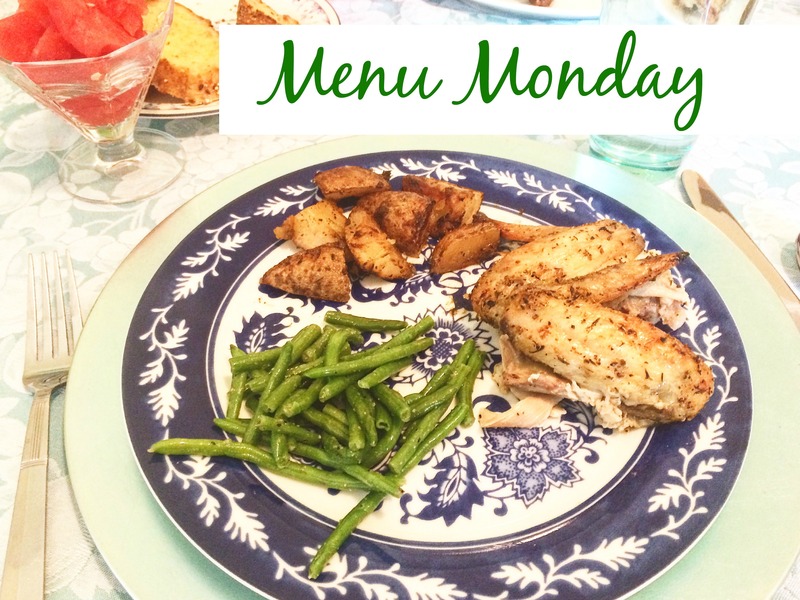 Below is last week’s menu – I didn’t share this last week, and it will show you what I served with my new meal planning strategy. Yum!! I love your efforts to plan healthier snacks. I enjoy hummus + veggies, fruit and I like to keep things chopped up in the fridge to encourage healthy snacking. We still do granola bars and goldfish, but it’s nice to mix it up a bit. Your quesadillas sound great and so do your burgers. We may just have to have those this week 🙂 I love meals where Kevin does the grilling and I make the sides! I wish we had a grill – it does make summer meal prep so much easier! I will never complain about your comfort food or love of carbs. If anything, I’ll beg for a dinner invite! Haha, aww love that! 🙂 You’re welcome anytime!! Your meals sound delicious! Summer is great time to take advantage of all the fresh fruits and veggies! I know! I love the variety in summer produce! I think it’s very good to be mindful of what we put into our bodies. Sometimes, it’s easy to get into a “rut” and eat a lot of a particular item. Adding extra fruit and veggies is an easy way to get extra nutrients, and sometimes it fills you up so you don’t eat a lot of other not-as-good-for-you things. But carbs are a necessary part of life, and they taste yummy. 🙂 Moderation is totally key in life! One yummy, low-carb dish I like during the summer months is a tuna salad-ish mixture served stuffed inside raw yellow/orange/red peppers. It’s a yummy combination and is very cool during the warm weather. So tasty!! !